Many people think that cleaning leather requires an array of products and is hard to do. Fortunately, those people are wrong. Most leather can be kept clean simply by applying the correct Pecard Leather Conditioner. As the conditioners are applied, they pick up and remove surface dirt. By rotating the cloth as it gets dirty, you’ll prevent dirt from being rubbed back into the leather. After you’re done conditioning the leather, gently buff it with a clean cloth to achieve a soft sheen. Cleaning leather can be that simple! However, if your leather needs a deeper cleaning or salt stains are involved, we recommend using clean water and a clean, damp, lint-free cloth or sponge. Working in sections, rotate the cloth to prevent rubbing dirt back into the leather. Make sure to freshen the water as often as needed, rinse the cloth frequently, and always use clean water. Keeping your water and cloth clean helps remove as much dirt as possible. When it comes to cleaning leather, salt stains can be a little tricky. This is especially true when it comes to suede and nubuck. We try to keep cleaning leather to a one-product process, but if salt stains are deeply set, you may need the leather cleaner we recommend below. 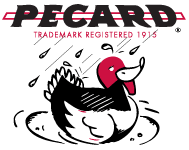 If your leather fits that description, Pecard now has a brand new cleaner added to its suite of products, and it’s just what the leather doctor ordered. It’s called Pecard Foaming Suede and Leather Cleaner, and it works wonders for leather that needs a deep cleaning, including salt stains that won’t come out any other way. It’s important to keep in mind that a cleaner is simply that – a method of removing dirt and grime. After you’re done cleaning your leather, it’s important to always follow up with a conditioner to restore the oils that have been removed by the cleaning process. However, when you use Pecard products to clean, condition, preserve, and protect your leather, it can last a lifetime or more!